Being a Toronto wedding photographer means constantly monitoring the new industry trends and coming up with original concepts. During this University of Toronto wedding, I decided to try something new. My brides often required that I take certain shots they really like and Renee showed me a picture she wanted. It portrayed a newlywed couple and the bride's veil was flying in the wind. However, instead of creating a carbon copy of that shot, I decided to improve it. As such, I asked one of the bridesmaids to throw the veil in the air a few times to capture the picture that my bride wanted. Once I created that shot, I went for the next level and included the bridesmaid throwing the veil in the air in the picture. Some would call this posed photojournalism because I started from a posed picture and added a photojournalistic element to it. To light the scene I used a Profoto B1 strobe diffused through a translucent umbrella. To make my subjects pop, I underexposed the scene by two thirds of a stop while the strobe gave me the correct exposure on the bride and groom. That allowed me to capture such a crisp shot with vibrant colours. What makes this photo great is that combination of posed and candid elements. For this shot I used a 35mm lens shot at F4.5. As usually, most of the work was done in camera. In post production I only added more texture to the background, applied dodging and burning and enhanced the colours of the scene. Also, I applied some skin softening for the bride and her bridesmaid. Every wedding photographer has his own preferences when it comes to photography locations. For me, University of Toronto is one of the top spots in Toronto for wedding imagery. 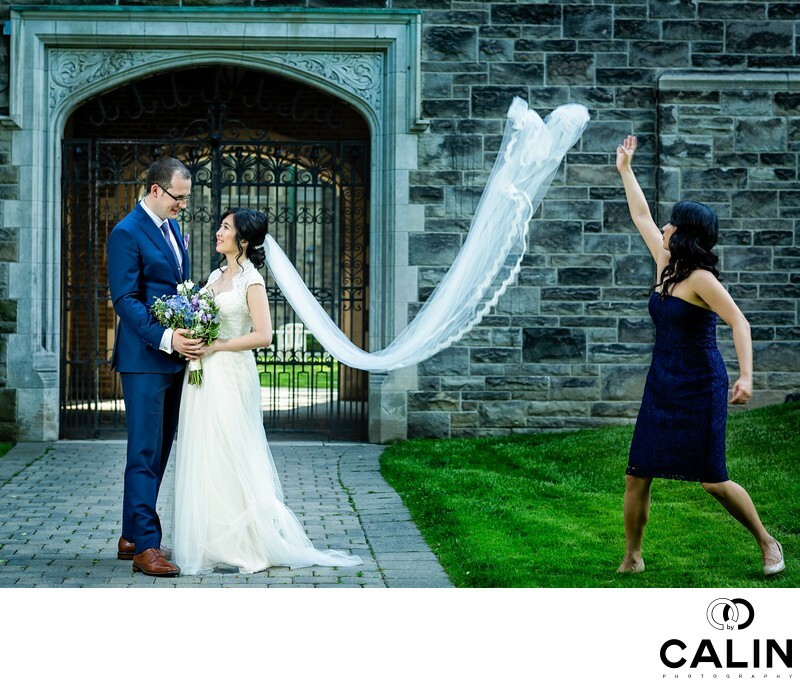 Built in the Gothic revival style so prevalent at the beginning of the 20th century, U of T offers perfect backdrops for your wedding pictures. In most of the cases you need a permit to photograph there. However, if you are getting married at one of the universities wedding venues, they include a free photography permit. Another aspect that you need to remember is that parking can be tricky in downtown Toronto. It is not unusual for a wedding photographer to take 10 minutes to find a parking spot in the area. As such I strongly advise that you build time buffers in your wedding itinerary to avoid unnecessary stress on your big day. For example, we were supposed to have a 1.5 hour photo shoot at this wedding. However, things ran terribly late and we ended up photographing for only 15 minutes. Fortunately, I usually have a list of shots ready so I can condense the photo shoot accordingly. In this case, my shot list came handy. Also the bride and groom have very laid-back personalities which helped a lot in creating natural looking photos. Had they stressed out, the result would be different. The colour scheme and this image includes orange skin tones, complemented by blue in the groom's and the bridesmaids outfits. Add the intense green grass and you have a perfect colour palette for a marriage picture. Location: 6 Hoskin Ave, Toronto, ON M5S 1H8.